Can a dual-engine antivirus catch more malware? This antivirus offering is configurable in the extreme, but we're struggling to see any other compelling reason to buy it. Emsisoft is a New Zealand-based company which has been providing antivirus solutions since 2003, and now has products covering everything from regular home users to demanding business types via its Enterprise Console. 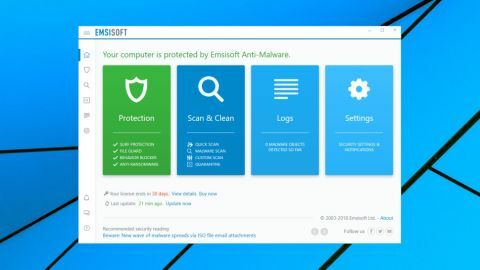 Emsisoft's baseline product is Anti-Malware Home, a capable offering which uses two engines (Bitdefender's and Emsisoft's own) to detect and block viruses, ransomware, 'potentially unwanted products' and more. The package is priced at a fairly average £26 ($33.80) for a one-computer, one-year license – to put that in perspective, Kaspersky Anti-Virus is £25 ($32.50), Bitdefender Antivirus Plus 2019 is £30 ($39). Adding more devices and extending your subscription cuts the price-per-system, but not quite to the level you'll usually see elsewhere. A three-device, three-year Emsisoft license costs £75 ($97.50), for instance, but choosing Kaspersky will see the price fall to £70 ($91), while Bitdefender asks £45.50 ($59.15) for the first year, £65 ($84.50) on renewal. If the price isn't an issue, a 30-day free trial enables checking out the product before you buy, and there's also a 30-day money-back guarantee as extra protection. The Emsisoft Anti-Malware trial was easy to download, and installed with surprising speed. There's no waiting around while a progress bar grinds oh-so-slowly onwards – it's finished almost immediately. Although the website prompts for your email address after the download, it's not a requirement. Emsisoft doesn't require you to 'register' or hand over any personal details at all, unlike many competitors. We browsed the Emsisoft program files to run a few checks, but couldn't see any issues. All the executables were correctly signed, including third-party components like OpenSSL and the Bitdefender engine, and they all appeared to be well-protected from attack. This isn't a package which malware can easily disable. As we've seen with previous reviews, Emsisoft Anti-Malware grabs a little more resources than usual, with the main Emsisoft Protection Service using an average of 300MB RAM even when idling in the background. That's not going to be a major issue for the average user, though, and the package compensates with reduced requirements in other areas. Emsisoft doesn't install chunky browser extensions to keep you safe from malicious websites, for instance – that all happens automatically at the network level. Emsisoft Anti-Malware has no significant bonus features, but somehow its interface still manages to be even more cluttered than most full-strength suites. There are four colored tiles titled Protection, Scan and Clean, Logs and Settings, for instance. Clicking any of these displays further panels stuffed with options, and scrolling down reveals even more elements to explore. This doesn't necessarily make the program difficult to use. If you're not technically inclined, you can ignore most of the options, and just click Scan and Clean > Quick Scan to run a basic malware check, or Logs to review what's happened recently. The real value here, though, is for more experienced users who'll appreciate Emsisoft Anti-Malware's extreme configurability. You can set up custom scans, for instance, defining exactly what they'll check and the low-level technical detail of how they check it. And a hugely flexible scanner enables running your scan type at a specific time or interval, during defined hours (every hour between 9am and 5pm on Mondays, Thursdays and Fridays), or on a system event (when Windows starts, or after you've plugged in a USB key). That's just the start. The URL filter can be extended with your own rules, or by importing your HOSTS file. You can precisely define when files are scanned, set up email notifications if malware is detected, customize when and how the program runs updates, decide which program events generate notifications, and control which user accounts are able to access Anti-Malware (great for stopping the kids changing your settings). Although we appreciate this power, the layers to the interface sometimes make it awkward to navigate. For instance, having a Logs panel on the front page might make you think it's easy to get a look at exactly what happened during, say, the last-but-one scan. But the reality is a little different. Click Logs and you get a complicated event log of all recent events, not just user actions. Scroll down to find the scan and you'll see items for both Scan Start and Scan Finish. Double-clicking Scan Finish displays a scrolling list of basic actions, without any of the results. You might give up at this point, but if you scroll to the bottom of that list, you'll see a 'View the detailed Scan log' which finally gives you all the information you need. Once you've learned your way around, this isn't difficult to do, but it doesn't feel particularly natural or intuitive, either. You probably won't spend much time navigating the interface, of course, and in regular real-world use the program performed reasonably well. Quick Scans checked running processes in around 15-20 seconds, and a more capable Malware Scan examined all the common infection points in around 90 seconds, while both scan types picked up all our sample threats. URL filtering was relatively weak, with the program catching less than half our test URLs. That's not as dangerous as it sounds – the antivirus engine correctly detected and blocked every malware download – but it's a definite weakness in the system. An Emergency Kit Maker enables creating a portable Emsisoft setup which you can save to a USB key and use to disinfect other computers. This is probably as basic as a recovery setup can be – it's just a couple of Windows executables – and so can't begin to match the power of a bootable recovery environment. But if you do have a second PC which has become infected, you'll probably be glad it's there. If you expect your antivirus to throw in a bundle of extras, Emsisoft will leave you disappointed. There's no password manager, secure deletion tool, system optimizer or anything else. It makes for a short feature list, but as this kind of bonus feature rarely competes with the best-of-breed freeware, we don't think it's a deal-breaker. While we run some malware detection tests during reviews, they can't compete with the large-scale efforts of the independent antivirus testing labs. Comparing and combining our results with their reports is the best way to get the big picture. AV Comparatives' regular real-world protection tests have placed Emsisoft in the bottom half of the list for most of second half of 2018. For example, the company was ranked 10th of 18 in July, 14th in August, 16th in September and 17th in October. These results clearly aren't great, but looking at the last summary report (February to June 2018) helps to put them in perspective. Emsisoft may have ranked a lowly 13th out of 18, for instance, but that's better than big names like Panda (14th) and BullGuard (17th), and not too far behind Avast (9th) and AVG (10th). If you're interested in Emsisoft's Android app, you might be more impressed by AV Comparatives' giant Android antivirus roundup from back in March 2018. The company tested more than 200 security apps, and while more than half were almost worthless, Emsisoft was one of only 28 to catch 100% of the sample threats. AV-Comparatives October 2018 Performance Test suggested that Emsisoft Anti-Malware has an above-average system impact, with Emsisoft placed a lowly 17th out of 18 top antivirus packages. The scoring system includes a lot of elements which may not bother you in day-to-day life, though (the delay introduced when you install or uninstall an app, for instance), and the differences in rankings can be very small. If the penalty of using Emsisoft Anti-Malware is that it takes half a second longer than usual to launch an application, for instance, you may well not care or even notice. Usually we try to compare the testing reports from multiple labs, but that's not possible here. Emsisoft isn't currently on the list of contenders at AV-Test or SE Labs. We did run a small test of our own, using a custom ransomware simulator we've developed to encrypt an entire folder tree of media and document files. As this was our own tool, we knew that Emsisoft was most unlikely to detect it from the file signature alone, making the test an interesting assessment of Emsisoft's behavior monitoring. Unfortunately, our simulator was able to run to completion, encrypting thousands of documents without Emsisoft noticing that anything that was going on. Our test threat wasn't real malware, so we can't be entirely sure why it was missed here. Especially as we know from AV-Comparatives' tests that Emsisoft Anti-Malware can detect real-world zero-day threats, so the package clearly picks up on at least some dubious behavior. Still, we have had much more success with other antivirus vendors. Bitdefender not only detected what was happening and killed our test process, it also recovered the small number of files the malware had managed to encrypt. Emsisoft Anti-Malware doesn't make any huge mistakes and we like its high level of configurability, but the package doesn't quite have the features, speed, ease of use or accuracy to compete with the best of the big-name competition.